Rivera is the greatest closer of all time. So what? Brad, Mason, Rob and I have been having an argument by text about Mariano Rivera. Brad, a Yankee fan, has been talking up Rivera's greatness, and his critical importance to the Yankees success over the past decade and a half. First point: Rivera is probably the best closer of all time. 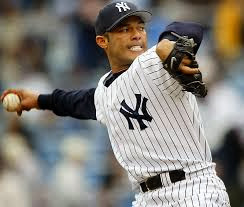 I have great respect for Mariano Rivera. He has been the top player at this position (or close to it) for a very long time. He has been incredibly consistent, and reliable. He will get in the Hall of Fame. Since other closers of lesser quality have already gotten in, he should too. He also appears to be a good guy, modest, and respected by teammates and opponents alike. To me, only two other closers in can be discussed in the same breath as Rivera: Trevor Hoffman, and Dennis Eckersley. The latter is already in the Hall. Hoffman will likely follow (he retired in 2011 I believe). So what follows is NOT an attack on Rivera, and how good a closer he is. I'm not even going to spend much time talking about his career stats here, because for the most part I don't think they're relevant for what I'm going to argue. Second point: the save, like 'wins' for a pitcher, is pretty close to a meaningless statistic. Why does Rivera have more saves than anyone else in the last two decades? Well, obviously one reason is that he's been better than other closers. Another is that he's stayed healthy and effective for a very long time. But another big reason is that he's played for teams that have won between 90 and 110 games virtually year. This means he's had more save opportunities. It also likely means that he has come into more games with 2 and 3 runs leads than many of his peers, making his saves easier. So: coming back at me with song and verse about Rivera's save numbers tells me nothing. Its a weak argument. Third point: Closers are closers not because they are very good pitchers, but because they aren't. Baseball pitchers don't go through Little League, Babe Ruth, college and lower minor league ball training as closers. Pitchers become closers, because they aren't good enough (lack the pitch variety or stamina) to be starters. Or because they get hurt, and can no longer do what a pitcher is supposed to do, so they try to 'save' their careers (and their arms). A starter, in theory, can get 27 outs while keeping the other team under 5 runs if they're average, under 4 if they're good. Or, to put it differently, if Rivera were good enough to pitch quality starts consistently, he'd be a starting pitcher. Why? Because a starting pitcher who gets quality starts is more valuable than a closer is. Or to put it differently, the vast majority of starting pitchers in baseball would be effective -- perhaps dominant -- closers. So why aren't they closers? Because they're more valuable as starters, that's why. A closer plays no role in helping his team to a lead, or in keeping that lead when it is most vulnerable. In the first 8 innings, he gets no hits, fields no batted balls, records no outs. For this reason, I would submit to you that in most years of Rivera's career, he was perhaps the 3rd or 4th MOST VALUABLE PITCHER on the Yankees (behind Mussina, Cone, Wells, Clemens, etc). When even a middle quality starter for the Yanks pitched 200 innings, he got 600 outs. A closer like Rivera pitches in less than 1/3 of his teams games, and in only 1/9 of that 1/3. It stands to reason that he is thus less valuable to his team than someone who pitches 3 times as many innings, and does so when the outcome of the game is still most in doubt. 4th point: closing baseball games is easy. Closing baseball games is easy, particularly in the 9th inning closer era. Starting pitchers have to go through the lineup at least twice, sometimes more. This means they must adjust as hitters adjust to them; they must vary their pitches; they have to pitch from the stretch sometimes. As they tire, they must find ways to get hitters out. Closers don't have to deal with any of this, usually. They come in with the bases empty. Hitters only see them once, so technically speaking, they really don't have to 'pitch' at all -- they can get by with just 2 or 3 pitches (1, in Rivera's case). Late innings in close games, their managers have generally put in stronger defensive players behind them, making their job easier. The notion that getting the last 3 outs somehow requires some kind of extra inner-fire or intestinal fortitude, and that this characteristic is rarely found, is palpable nonsense. Rivera doesn't get guys out with mental toughness. He gets guys out with pitches, and the defense behind him. For the reasons I've stated above, a starter requires far more mental toughness (and mental work) to do his job, than a closer requires to do his. The overwhelming majority of pitchers who have pitched in the 9th inning with a lead have left the game winning. Let's look at numbers. Statistical studies of MLB history indicate that teams that have gone into the 9th inning ahead have won 95% of the time -- over all of baseball history. Teams winning after the 6th inning win over 80% of the time. Teams winning after 1 inning win 70% of the time. These numbers have varied little over time, and HAVE NOT GONE UP in the era of the 9th inning closer. The 1978 Mariners won the lowest percentage of games they led after 8 innings in history -- and they still won 80% of them. This tells us that any individual closer is unlikely to have a significant impact on the number of games a team wins in a given year, beyond what any average pitcher has done over nearly a century of baseball. This tells us that while the emotions might heighten in the 9th, when the game is coming to an end, your chances of success are higher (and the challenge is thus lower) if you pitch only the 9th inning than if you were to pitch in any other single inning prior to it. Let's say 3 guys are trying to cut down a tree. The first guy ('starter') takes 18 whacks at the tree. The second guy ('middle reliever') takes 6 whacks at the tree. The third guy ('closer') takes 3 whacks at the tree. The tree falls. Rank these 3 guys, in order of greatest importance. Point 5: individual closers make very little difference to a team. Look at the Red Sox this year. They've used Koji Uehara as their ninth-inning guy in recent months, after Andrew Bailey and Joel Hanrahan broke down earlier this season. All of a sudden, Uehara looks like the best reliever in the league since the All-Star break, with a 27-to-1 strikeout-to-walk ratio and five hits allowed in 21 innings. That's Koji Uehara, a 38-year-old right-handed journeyman with a fastball that barely breaks 90 mph, and who had 14 career saves in four years prior to 2013. We might also note that the 2012 Yankees lost Rivera in May, and promptly replaced him with another guy (Soriano) who got 42 saves. In other words, the 'job' of closer isn't a difficult one. The hard and important work has already been done. 95% of all pitchers, in all of baseball history, who have pitched in the 9th inning with a lead, have walked off with their team winning. Now, you can argue that that 5% really matters -- over a 162 game season, that's approximately 8 games a year, that teams lose when they go into the 9th with a lead. Since even middle-quality closers generally succeed in 70-80% of their opportunities, that means that you could put Joe Closer in and potentially hold 5 to 6 of those 8 leads. Since Rivera has been very effective, let's say he holds 7 of them...but we should of course note that he has played for consistently very good (and often great) teams, and thus has come into many games with 2 and 3 run leads. A very popular measure that sabremetricians use to figure out how valuable players are to their teams is Wins Above Replacement (WAR): the number of wins that a player added to a team, above what an average player at that position would have added. They can calculate WAR for a player in a single season, or over a career. According to Baseball Reference, Rivera is ranked 209th -- right next to Tim Hudson, and below such sure fire Hall of Famers as Chase Utley and Andruw Jones. And of course, his WAR is somewhat inflated by two things: his longevity, and the fact that his replacement value is measured by the win differential if he were replaced by another closer. WAR counts saves. As I noted above, the save is a deeply problematic statistic. As a consequence, WAR actually overrates the value of closers. WAR tells us that even the greatest closers are only worth about two more wins per season than their eighth-inning counterparts. Does that make Rivera a great baseball player, a great pitcher? No. The closer (particularly the 9th inning closer, which Rivera typified) is vastly overrated by fans and pundits alike. Arguments that Rivera belongs on a list of the greatest Yankees of this era (let alone all-time) are foolish. Obviously if we include intangible things -- consistency, character, face of the franchise, public persona etc -- then Yankee fans are entirely within their rights to consider him a great Yankee. But an all-time great player? No. We overrate the closer, because that's the person on the mound during that dramatic moment when the game is about to end. But the closer is arguably one of the least important players on the winning team that night, particularly if he comes in with the bases empty (as Rivera virtually ALWAYS does). I'll go further. Arguably, no closers should be in the Hall of Fame. Why not middle relievers in the Hall of Fame too? Show me how a top-notch middle reliever, often pitching the 7th-8th innings (more, if the starter doesn't pitch well), is less valuable than a closer. An out in the 9th inning is the same as an out in 7th inning. Why not put 3rd down situational backs in the football Hall of Fame? We're talking about 'positions' that have only existed for a very small percentage of the history of the sport -- positions that in fact DON'T EXIST, in terms of the rules of baseball. Many people have argued that the creation of these 'positions' has been bad for the game, and that a franchise could make better use of its talent and resources by getting rid of one or both. Closers are the placekickers of baseball. They spend almost no time on the field, and thus have no impact whatsoever on the vast majority of plays/innings. 95% of games are won by the team that goes into the 9th with a lead, regardless of who pitches that 9th inning. Closers are statistically interchangeable, easily replaceable, and in most ways unnecessary. But closers are different from kickers in one important sense: they are less valuable to their teams than placekickers are. A team cannot do without a kicker, and expect to win games consistently. A baseball team can (and, for most of the 20th century, did) win without ANYONE serving as the closer. Now, since there are closers in the Hall of Fame already, we cannot justifiably keep out great closers now or in the future. So on that basis, Rivera will and should get into the HOF. But since most of those 70s/80s era closers tended to go 2 or even 3 innings, most of the best ones were arguably more valuable to their teams than Rivera has been to his. Rivera's longevity and consistency would temper this judgment. So, since there is a precedent, he should be in the Hall of Fame. But if we were taking the Hall seriously, and only putting in great pitchers, no closer would get in. None. This is a hard argument to make, and I don't particularly want to make it. Rivera's greatness is sort of like what they say about beauty -- you know it when you see it. And there is something truly amazing about a guy being able to get outs and dominate with just one pitch, for almost two decades. I grant all of that. But the argument I'm making above isn't really about Rivera. Its about all closers. I could make it about Gossage, Eckersley, Hoffmann, etc etc. While its slightly less true about Rivera because he's the greatest of the lot, it is nonetheless still true. Is it wrong to send your children to a private school? Allison Benedikt recently posted an article on Slate that has gotten a lot of attention. In it, she argues that parents with the resources to have a choice about where to send their children to school are morally obligated to send them to public school. Or, to put it differently, she has serious questions about the morality of sending your children to private school. Everyone needs to be invested in our public schools in order for them to get better. Not just lip-service investment, or property tax investment, but real flesh-and-blood-offspring investment. Your local school stinks but you don’t send your child there? Then its badness is just something you deplore in the abstract. Your local school stinks and you do send your child there? I bet you are going to do everything within your power to make it better. The children of parents with the resources to have educational choices will generally do just a fine in a mediocre (presumably urban) public school, she argues. Whatever you think your children need—deserve—from their school experience, assume that the parents at the nearby public housing complex want the same. No, don’t just assume it. Do something about it. Send your kids to school with their kids. Use the energy you have otherwise directed at fighting to get your daughter a slot at the competitive private school to fight for more computers at the public school. Use your connections to power and money and innovation to make your local school—the one you are now sending your child to—better. Don’t just acknowledge your liberal guilt—listen to it. I agree with the sentiment, for the most part. My kids go to an urban public school, a charter school where the vast majority of the children live in poverty (Title I), and which reflects the racial and ethnic diversity of the city as a whole. I have some pretty big problems with charter schools in the aggregate, for many of the reasons I discuss below. But the larger issues Benedikt raises apply to me as much as to anyone. In my ideal world, there would be no private schools. But in my ideal world, there would also be no exclusionary zoning in the suburbs, no racial and class segregation of housing and schools, and urban schools would be funded by progressive income taxes and fully enveloped in metropolitan school districts that include cities and suburbs. But we don't live in that world. So as urban parents of privilege (with enough resources to have choices, in other words), we have to make decisions about where we send our kids to school. And the most useful part of this article is that it stresses that this act -- of choosing where to send your children to school -- is a political and moral act, whether one wants it to be or not. In other words, it has consequences for others, and for our common institutions. At the same time, though, I do think Benedikt overlooks or downplays the fact that we do have moral obligations to our own children and their future well-being too. At present, in most American urban school systems, for those parents with the resources to actually have a choice, these moral duties are too often in conflict. Many parents use their resources to resolve the conflict by removing their children (and themselves) from the situation entirely -- private schools, or moving to the suburbs. And there is an ideological rap out there, shamefully shared by liberal Democrats as well as the GOP, that allows too many of us to just blame the problems of urban schools on the teachers, the unions, the kids, bad parents, etc etc., allowing us to get off easily. In some ways this whole set-up is emblematic of what has happened to us in 'Reagan's America' -- public goods and institutions are for suckers, we're told. Benedikt is right to say that we (urban parents with resources) should feel a moral conflict here. And she is right (and supported by research) when she says that 'our' kids will do OK regardless. And she is right that we should stay and exercise our 'voice,' rather than just exit because we can. But I do think that policy matters more, in the end, than the moral choices of individual parents. We need far more low and moderate income housing in the suburbs. We need to get away from property tax funding of public schools. We need metropolitan school districts. We need universal public pre-k. But presently both political parties seem committed to policies more likely to destroy public schools than to improve them, so there is nothing in our national discourse that points parents toward realistic change they can believe in or act upon. Given that, we take care of our own, as we are obliged to do. Maybe the only way to inject true reform ideas into that discourse and to give us choices that aren't morally conflicted and zero-sum is for more of 'us' to stay in the urban public schools and fight, as Benedikt indicates. At the very least, if we begin to see our acts as inherently weighted politically and morally, perhaps more of us will begin to see where we have to go politically so that our kids don't grow up and face the same dilemma.